Quinn Robbins wasn't the kind of girl who had adventures. She wasn't even the kind of girl who got invited to parties at Bristlecone High School. And she definitely wasn't the kind of girl who would follow a boy she knew nothing about over a broken bridge into a mysterious alternate universe. Until the night she did. Now, trapped for ten days with a boy who never wanted her there, Quinn finds a strangely welcoming reception from the rulers of the kingdom. 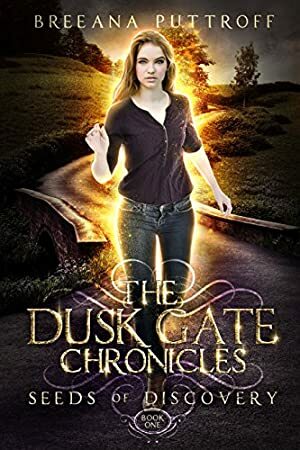 Just as she's beginning to unravel the secrets of this extraordinary new land, a mysterious threat puts all their lives in danger, and Quinn may hold the key to saving everyone. Quinn is about to discover that the best adventures are the ones you never expected. Fully feeling the weight of her stupidity, she climbed the four crumbling stone steps toward the end of the broken-off bridge.This time, she did not hold back or hesitate. She closed her eyes and stepped forward. Expecting only a loss of balance and the resulting short drop into the cold water below, she was surprised when it didn't come. There was solid stone underneath her right foot. Maybe she had missed. When a second attempt with her left foot also failed to produce an icy-cold plunge into the stream, she opened her eyes. Seeds of Discovery is the first book in the beloved Dusk Gate Chronicles. Find out for yourself why readers are falling in love with Quinn, William, and the rest of the Rose family. Log In to track Breeana Puttroff on eReaderIQ. to be notified each time the price drops on any book by Breeana Puttroff. to stop tracking Breeana Puttroff. We started tracking this book on December 29, 2012. The price of this book has changed 50 times in the past 2,304 days. The current price of this book is £0.99 last checked 12 hours ago. The lowest price to date was FREE last reached on February 23, 2019. The highest price to date was £0.99 last reached on February 24, 2019. This book has been £0.99 16 times since we started tracking it. We last verified the price of this book about 12 hours ago. At that time, the price was £0.99. This price is subject to change. The price displayed on the Amazon.co.uk website at the time of purchase is the price you will pay for this book. Please confirm the price before making any purchases.